Meet John Reynolds and Gerhard Pfau and learn about IBM BPM Coach Views. The IBM® Coach Framework is a key element of the IBM Business Process Manager (BPM) product suite. With the Coach Framework, process authors can create and maintain custom web-based user interfaces that are embedded within their business process solutions. This ability to create and maintain custom user interfaces is a key factor in the successful deployment of business process solutions. Coaches have proven to be an extremely powerful element of IBM BPM solutions, and with the release of IBM BPM version 8.0 they were rejuvenated to incorporate the recent advances in browser-based user interfaces. 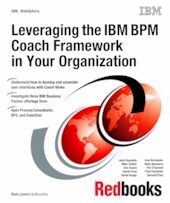 This IBM Redbooks® publication focuses on the capabilities that Coach Framework delivers with IBM BPM version 8.5, but much of what is shared in these pages continues to be of value as IBM evolves coaches in the future. This book has been produced to help you fully benefit from the power of the Coach Framework.